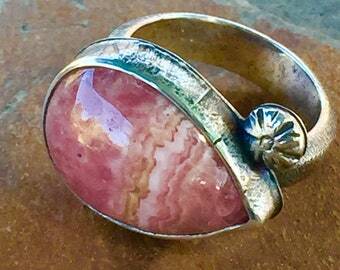 Exotic jewelry, handmade by Susan DeCreny Siering. 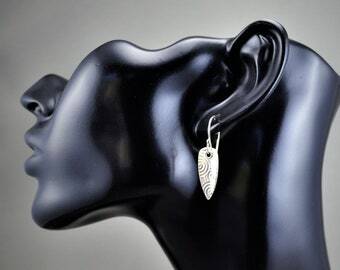 Large Stacked roller printed silver earrings. Petrified palm and faceted aqua chalcedony silver post earrings. Announcement Welcome to my shop! I create unique personal ornaments with precious and unusual materials. Everything is handmade by me using traditional jewelry fabrication techniques, no two pieces are identical. Made in sunny Southern California, USA. Welcome to my shop! I create unique personal ornaments with precious and unusual materials. Everything is handmade by me using traditional jewelry fabrication techniques, no two pieces are identical. Made in sunny Southern California, USA. 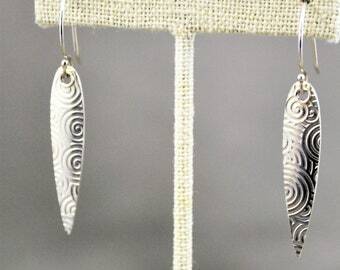 Handmade - artisan jewelry - Roller printed sterling silver long drop earrings with Argentium Sterling silver earring wires. 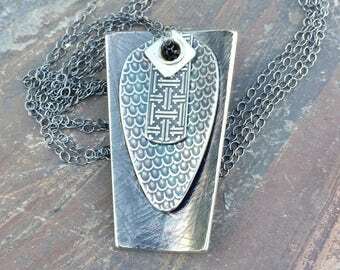 Handmade - artisan jewelry- Roller printed sterling silver triangle earrings with Argentium Sterling silver earring wires. 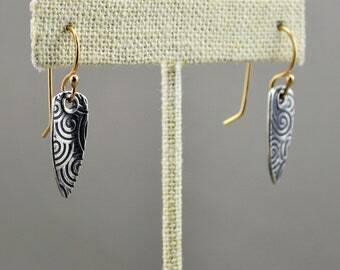 Hand made - artisan - Roller printed sterling silver drop earrings with Argentium sterling silver earring wires. 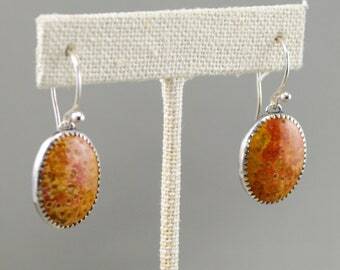 Petrified palm and faceted fire citrine silver post earrings. 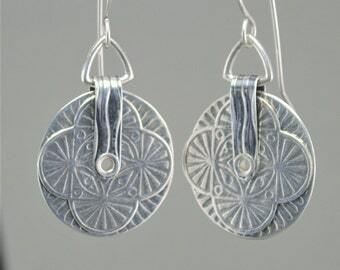 Hand made - artisan jewelry - stacked roller printed sterling silver earrings. Stacked roller printed silver earrings. Beach pebble ring with square hammered band. Wide patterned square band ring with old copper coin. Flat dots band ring with purple chalcedony cabochon. 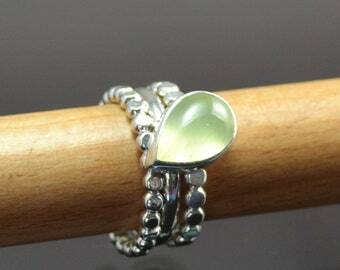 Stacking dotted band 3 piece ring set with prehnite cabochon. Hammered stacking ring with patina. What a lovely ring, so beautifully unique and special! Susan went above and beyond to make sure the ring was perfect for me. I highly recommend this shop, you won't be disappointed in the quality or service. Thank you so much! Love...love...love my new earrings! Perfect transaction...will definitely buy from again. Small stacked roller printed silver earrings. I bought these for a present; I am sure she will love them. Keshi pearl and Oregon sunstone flat briolette earrings. Free shipping on all items in the shop! I'm thrilled to have been accepted to this show! Please stop by for a visit. 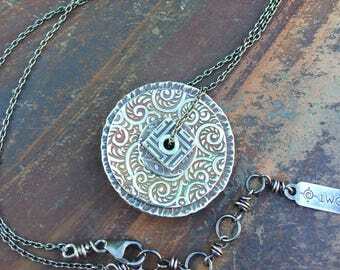 New listing - multi stone inlay necklace! Handmade sterling clasps on gemstone chokers. 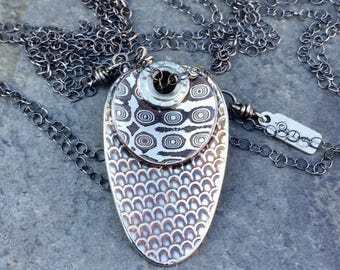 1 World Creations - handmade jewelry by Susan DeCreny Siering. Since 1993 I have been making beautiful handcrafted works of wearable art jewelry for my company, 1 World Creations. I was born in Brooklyn New York and now make my home in Southern California with my husband Jim and Rocky, a cat rescued by our adult daughter Ruby. 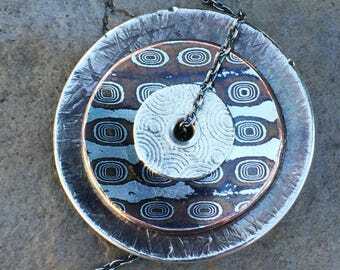 After years of jewelry making experience, learning a new technique still gives me a thrill. My decades long obsession began with the loomed beadwork I sold as a teenager in the 60s in New York City, where I grew up among artists and educators. My current work goes beyond basic fabrication to include techniques such as stone setting and inlay, alloying, overlay, etching, roller printing, granulation and keum boo. My work is influenced by my African American and Caribbean background, as well as by an interest in geology, natural and architectural forms, and the aesthetics of art nouveau. The designs are my own, and while I occasionally use a few high quality manufactured clasps and chains, all other elements are made by my hands individually and with attention to every detail. There's a piece of my soul in each one. Having recently concluded a successful career in the Film Music Business, I am excited to devote my energies to full-time jewelry making in my sunny studio. I hope you will follow my journey!